Students from the University of South Alabama wishing to pursue a degree with the Auburn University Harrison School of Pharmacy will have a new path thanks to a program announced Tuesday. The new Early Assurance Program, or EAP, creates a clear path for prospective and current University of South Alabama students to receive conditional admission to Auburn’s pharmacy program. EAP will allow qualified freshmen and undergraduate students at South Alabama to receive early conditional admissions into pharmacy school. Auburn will then hold positions in future Pharm.D. classes for these students, provided that they meet specific standards as undergraduates. Since Auburn and South Alabama collaborated in 2007 to provide a pharmacy campus in Mobile, more than 200 students have received the doctor of pharmacy degree from the Mobile campus. Under the terms of the new EAP, high school seniors would be required to apply to USA, receive an offer of admission to USA and then apply for the EAP through South’s JagSPOT scholarship portal by Feb. 15 of each year. If the student meets the eligibility criteria, their application would be sent to Auburn pharmacy for review, with selected applicants invited to submit an EAP application via PharmDirect, an application service provided by the American Association of Colleges of Pharmacy. Interviews for selected applicants would take place in March, after which a decision would be made for each applicant. High school seniors admitted to USA must have a minimum high school grade point average of 3.5 and a minimum ACT Composite and STEM scores of 26 (or comparable SAT scores) to be eligible for the EAP. For South Alabama undergraduate students, the deadline to apply for the EAP is Sept. 15. If the USA student meets the eligibility criteria, their application will be sent to Auburn pharmacy for review with selected applicants invited to submit an EAP application. Interviews for selected applicants would take place in March. High school students interested in learning more should contact USA’s Office of New Student Recruitment at 251-460-7834 or recruitment@southalabama.edu. Current USA students wanting additional information should contact the Harrison School of Pharmacy at USA at 251-445-9300 or email pharmd@auburn.edu. 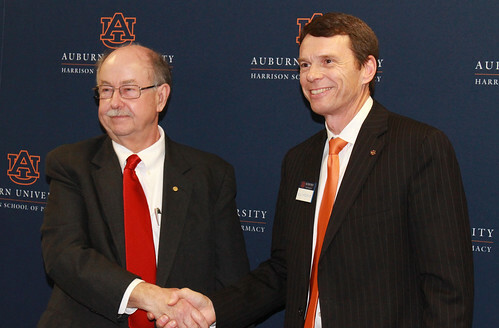 David Johnson, provost and senior vice president at the University of South Alabama, and Bill Hardgrave, Auburn University’s provost and senior vice president, participated in a ceremony Feb. 12 to mark a partnership between the two campuses. The Early Assurance Program creates a clear path for prospective and current University of South Alabama students to receive conditional admission to Auburn’s pharmacy program on the Mobile campus.